I’m very sorry to have to report that Alice Byrd, the beloved longtime box-office manager and hostess at Orlando’s Mark Two Dinner Theater (and before that the Mark One in Lakeland), died last night. 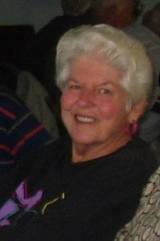 I have had word from actress Ann Hurst that Alice Byrd, who was the longtime box-office manager for the Mark Two Dinner Theater, is seriously ill and is in the Lakeland Medical Center. Ann suggests that it would do Alice good to hear from her friends.